LAHAINA CANNERY MALL. 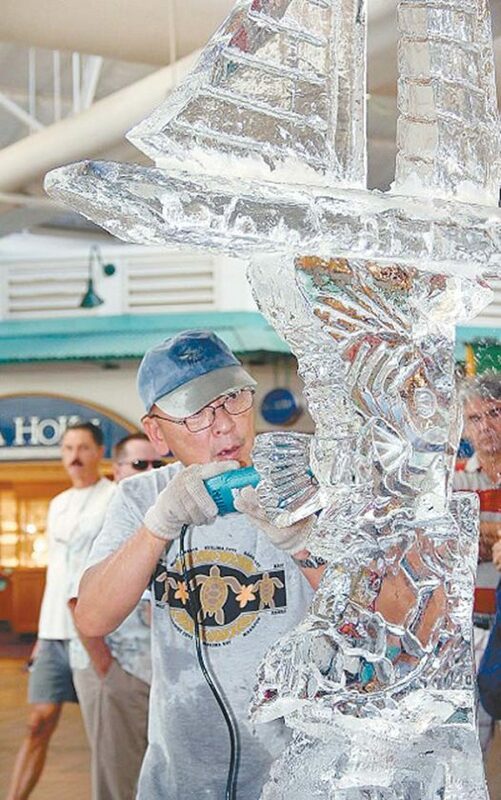 Thursday (today): Hula lessons, 5 p.m.; Na Kamali’i Nani O Lahaina, 6:30 p.m. Saturday: Ice Sculpting Exhibition, 11 a.m. to 1 p.m.; Family Magic, noon; Te Tiare Patitifa, 1 p.m.; Yu-Gi-Oh card session, 3 p.m. Sunday: Ice Sculpting Competition, 11 a.m. to 1 p.m.; Te Tiare Patitifa, 1 p.m. Tuesday: Free ukulele lessons, 5:45 p.m.; Na Kamali’i Nani O Lahaina, 6:30 p.m.
MAUI MALL. Sunday: Zumba by Keoni’s Hot Lava Dance Fit Studio, 9 a.m.; Whole Foods Arts & Craft Fair, 10 a.m. to 2 p.m. Hula by Halau Hula O Keola Ali’iokekai, 11 a.m. OUTLETS OF MAUI. Thursday (today), Saturday, Monday and Wednesday: Tahitian show, 6 to 7 p.m. Friday: Hula lessons, 2 to 3 p.m.; Ukulele show, 5 to 5:45 p.m. Sunday: International dance, 6 to 7 p.m. Monday: Coconut Husking demo, 4 to 5 p.m.; Mike Finkiewicz, 5 to 7 p.m. Tuesday: Ukulele lessons, 11 a.m.; Barefoot Minded, 6 to 8 p.m. Wednesday: Lei Making, 2:30 to 3:30 p.m.; Hawaiian Arts & Crafts, 4 to 5 p.m.; Vincente Cacal, 5 to 7 p.m.
QUEEN KA’AHUMANU CENTER. 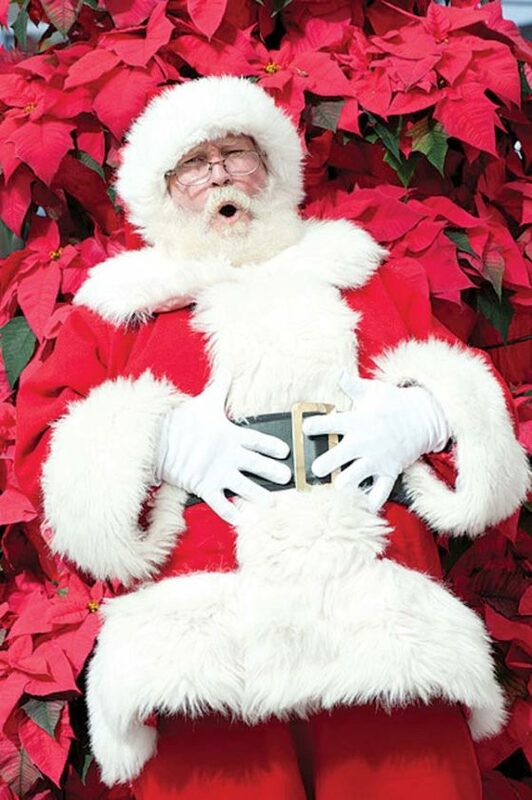 Friday, Tuesday and Wednesday: Farmers market, 8 a.m. to 4 p.m. Friday: Let’s Kokua Together, 5 to 9 p.m.; Kamaaina Nights with Sista Val, 6 to 8 p.m. Saturday: Santa’s arrival via classic hot rod with special meet and greet for keiki at Center Court with entertainment , holiday crafts and more, 10 a.m. to noon; Cruise Night with Friends of Hot Rods & Classic Cars, 5 to 9 p.m. Sunday: HouseMart/Ben Franklin Winter Craft Fair, 9 a.m. to 2 p.m.; Shodo calligraphy artist, 11 a.m. to 1 p.m. Monday: Salvation Army Angel Tree, 9 a.m. to 9 p.m. through Dec. 16. Wednesday: Haiku in English at Maui Friends of the Library, 4:30 to 6 p.m. THE SHOPS AT WAILEA. 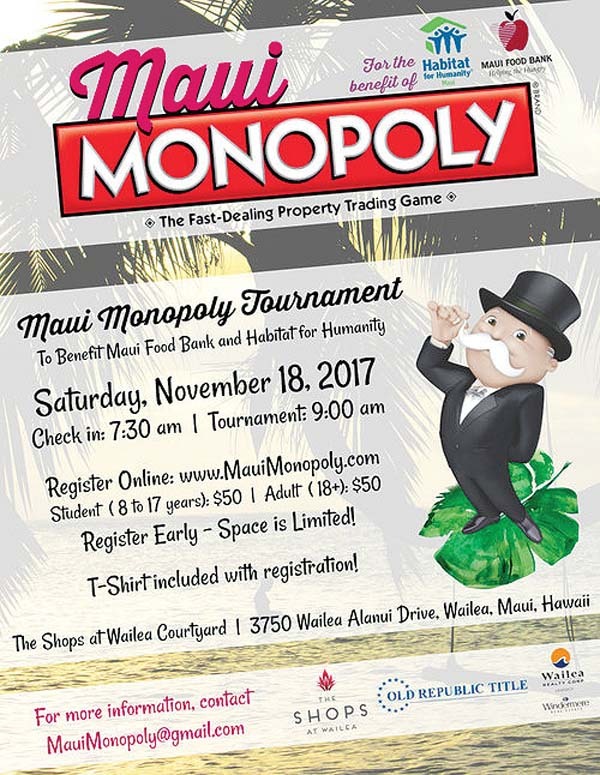 Thursday (today): Coconut frond weaving, 2:30 p.m.; Polynesian show, 5:30 p.m. Friday: Island Wood Carvings, 12:30 p.m., Ukulele lessons, 3 p.m.; Pau Hana with Larry Endrina and Kristine Snyder, 4 to 6 p.m. Saturday: Maui Monopoly tournament, a benefit for Maui Food Bank and Habitat for Humanity, entry fee $50, check in at 7:30 a.m.; tournament at 9 a.m. to 3:30 p.m.; Zumba, 8:30 to 9:30 a.m. Monday: Hula dance workshop, 1 p.m.; Lei po’o making, 2:30 p.m.; Ukulele lessons, 5:30 to 6:30 p.m. Tuesday: Coconut husking, 2:30 to 3:30 p.m.; Polynesian show, 5:30 to 6:30 p.m. Wednesday: Island wood carving, 10:30 a.m.; Lei po’o making, 1:30 p.m.; Market at The Shop, 4 to 6 p.m.